Anarchy and indiscipline still continue on roads in the capital and elsewhere in the country, causing frequent accidents and huge loss of lives. Almost everyday, reckless driving is costing lives on different roads in the country. Road accidents are taking place frequently because of reckless driving, overtaking tendency of drivers, pedestrians’ reluctance to use footbridges and lack of traffic responsibility on the part of passengers, police sources said. According to sources, about 5,000 to 6,000 people die in road accidents in the country every year. Bangladesh Road Transport Authority (BRTA), Dhaka Metropolitan Police (DMP) and Dhaka Transport Coordination Authority (DTCA) have blamed drivers for 90 percent of the accidents, citing rash driving as the main reason. They explained that drivers compete with each other to get more passengers. But the drivers put the blame on the passengers, saying that the passengers constantly hassle them to drive fast, distracting them from focusing on the road. Experts have stressed the need for raising awareness among passengers and have discouraged the drivers from having desperate and competitive attitudes on the road. Within last 48 hours till Saturday, at least 10 people were killed and scores others wounded in separate road accidents in the country, including Sirajganj and Ashulia on the outskirt in the capital. Three people, including a pickup van driver, were killed in an accident near Bangabandhu bridge on Saturday morning. Two passengers and the pickup van driver died on the spot, said Abdul Hamid, Deputy Assistant Director (DAD) of Sirajganj Fire Service. The bodies were sent to 250-bed Bangamata Sheikh Fazilatunnesa Mujib General Hospital morgue. Their identities could not be known immediately. On Friday, two people were killed and three others sustained injuries after being hit by a truck at Ashulia in Savar on the outskirts of the capital. The accident took place in Itkhola area around 6:30am when a sand-laden truck hit a rickshaw and a pedestrian, leaving the rickshaw-puller dead on the spot and four others injured, said sub-inspector Abdus Salam of Ashulia Police Station. The injured were taken to Women and Children Healthcare Centre where doctors declared Mousumi dead and sent three others to Pangu Hospital in the capital. Four days ago, hundreds of angry readymade garment (RMG) workers took to the streets at Malibagh in the capital as two teenagers, including a female RMG worker, were killed by reckless driving of a bus driver. The protesters torched at least one bus and damaged at least 50 buses in the area, witnesses said. The deceased were identified as Nahid Parveen Poly, 19, an employee of MH Garments Factory in Malibagh, and Meem Akhter, 14. Meem was killed on the spot while Parveen was seriously injured, said sergeant Shuvo Kumar Dey, who took Parveen to Dhaka Medical College Hospital (DMCH) immediately after the accident. The doctors on duty pronounced her dead at the hospital, said ASI Jamal. Recent, death of a BBA student and a Pathao passenger under the wheels of passenger buses in the capital have infuriated the commuters. Enraged by the death of the BBA, his fellow students took to the city-street and blocked a road in Mirpur. In the wake of scores of deaths on roads, Prime Minister Sheikh Hasina recently issued some directives, including driving-time limitations on drivers of long-haul vehicles, to prevent accidents and casualties. The “procession of deaths” on roads would stop if the PM's directives could be implemented immediately, Mozammel Huq, general secretary of Bangladesh Jatri Kallyan Samity said. Mozammel said 34.02 percent accidents occurred due to head-on collisions while 32.72 percent took place as vehicles ran over pedestrians and 13.23 percent happened after drivers lost control over the wheel. Plying of unfit vehicles, lack of rest for drivers, unskilled drivers and helpers, plying of slow-moving vehicles on highways, reckless driving, poor monitoring and bad road conditions were to be blamed for the accidents, he said. The organisation also came up with 10 recommendations to prevent road accidents. Those include making National Road Safety Council an effective organisation, providing training to drivers by the government, stopping movement of unfit vehicles, conducting road safety audits regularly, constructing a separate lane for speedy vehicles, and implementing the government ban on three-wheelers and slow-moving vehicles on national highways. Besides, the desperate plying of Mahendros, Easybikes, auto-rickshaws, Nochimons and Karimons are responsible for road accidents, he added. Mofij Uddin Ahmed, joint commissioner of Dhaka Metropolitan Police (traffic-north), said various punitive measures are taken against reckless drivers. He held both bus drivers and victims responsible for road accidents. 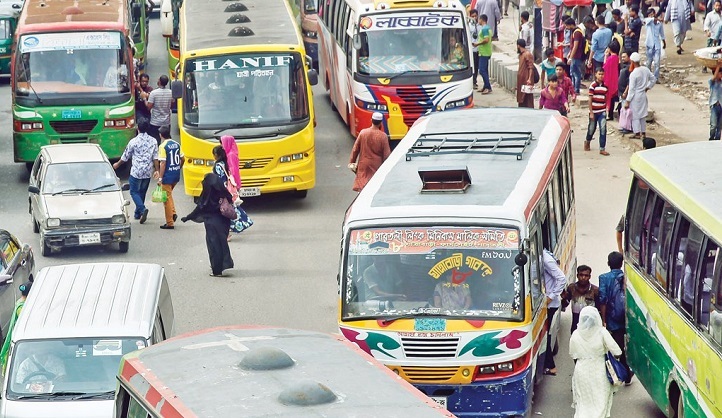 According to BRTA, there are 35,000 buses and mini buses, half of which operate outside Dhaka. Some of them are out of order. Fitness of 18,000 of these bus and mini buses are not updated. There are five thousand of unfit buses in the capital. According to transport owners, half of the drivers in Dhaka are young and drug addicted. Most of them have no legal licenses.